Is there any way to program or limit the forum (probably on Tapatalk actually) so we don't have to see this? Very hard to read. Seems to happen on a member by member basis, and when a member (who otherwise doesn't have the occurrence) copies and pastes from another source. This happens when you make a post on the Nook, and don't use the standard font and text size, but try to alter it. We have a new french guy on the forum, a fan of LPL soaps, that constantly alters his text. When reading The Nook on Tapatalk, I skip his posts for this reason. Agreed, it is terrible to try and read it. Wish there was a fix for it. (03-18-2017, 05:14 PM)CHSeifert Wrote: This happens when you make a post on the Nook, and don't use the standard font and text size, but try to alter it. For well over two millennia, Western letterforms evolved for ever greater legibility and beauty. The creations of type designers Bruce Rogers, Frederic Goudy, Hermann Zapf, and (Zapf’s wife) Gudrun von Hesse, inter alia, represent the apogee of that long era of improvement.
. . . Until the 1970s, when fashions changed, and suddenly it was “cool” to revert to pre-school stick figures — the kinds of letters than a child can draw with a stick in the dirt — for typefaces (as distinct from fonts) in applications where sans serif typefaces had long since been superseded by much more legible and much more beautiful letterforms. If you have access to a library that has shelves of printed volumes, you will find that every book on the shelf that is (a) not aimed at pre-school children and (b) is more than a very few pages long is set in a serifed typeface. There is a reason for that: serifed typefaces are easier to read — and visually more aesthetic — than sans serif typefaces. If I did not use a web browser (Seamonkey) that permits me to override what CHSiefert alludes to as “the standard font” (he means typeface, not font), I would not, and, indeed, could not read The Shave Nook. It is literally painful — I get a headache in a short time — to read text set in Arial, no matter how “standard” or “cool” some may deem those execrable abominations to be. (04-07-2017, 05:24 PM)MaxP Wrote: @Mel. Thank you for the encomium. 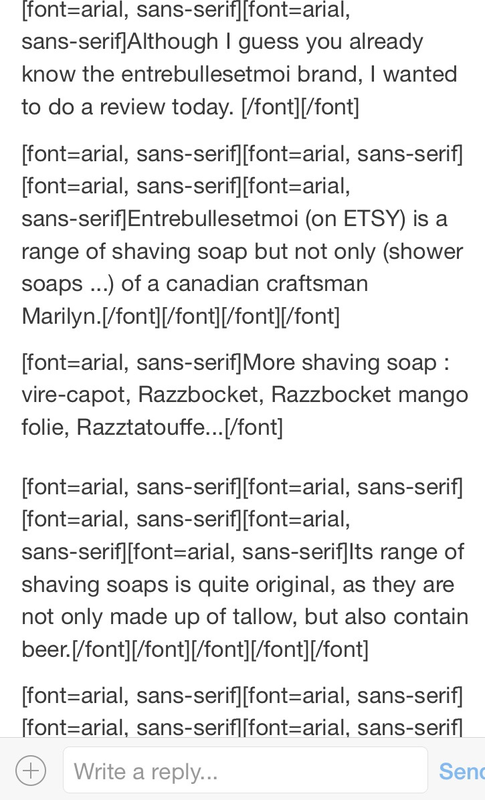 FWIW, I read The Shave Nook (and pretty much everything on-line) in Verdigris MVB, a modern typeface optimized for legibility based on the proportions of the faces drawn by Robert Granjon in the third quarter of the 16th century. I have programmed Seamonkey (my browser of choice) to override the typefaces that are displayed on most websites, displaying the text on my screen in Verdigris MVB instead. 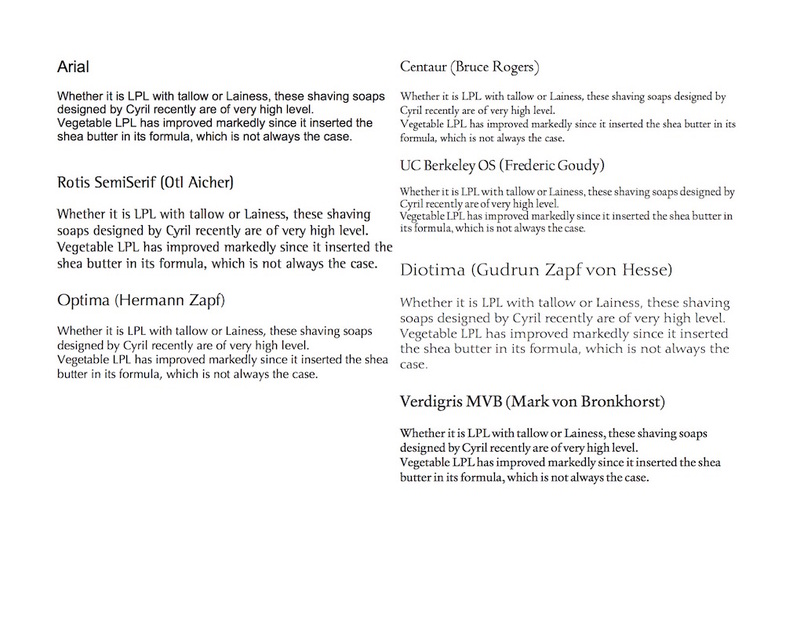 To illustrate the differences in aesthetics, the reduced size image below shows the same text (which I copied from the body of a Shavenook post by PapySnake) in Arial and six widely varied typefaces. Rotis Semiserif and Optima are classified as serifed typefaces because the designers used subtle terminations on the strokes that comprise each character to differentiate them from unterminated strokes in sans serif designs like Arial. Bruce Rogers designed Centaur for the Metropolitan Museum of Art. Frederic Goudy drew UC Berkeley Old Style in the 1930s, and it remains today the official typeface of the University of California Press. When Hermann Zapf married Gudrun von Hesse, they selected her calligraphy-inspired Diotima for the typeface of their wedding invitations.